SK20 has organ, preset strings and polysynth sections. The SK series was a popular combo-keyboard line. SK20 was released in 1980 and is enclosed in rugged housing, gives 5 octaves and features Leslie simulator, vibrato, attack, a slider for “brilliance” settings as well as an octave transpose switch. The instrument and the series are not multi-featured but the sounds are worth a purchase. The organ section provides adjustable decay, sustain and brilliance. The sounds remind of B3 which is surely good. Organ section is based on FM and with the addition of some vibrato, tremolo or ensemble chorus you can achieve that 70s sound. SK20 can be proud of its strings section which is always a delicate part of combo keyboards but the SK series make it sound as decent as ARP Omni does. SK20 got a polysynth section added. The synth part has a 7-note polyphony and two oscillator per voice offering filter, envelope, pitch, and portamento amount control. The oscillators can be detuned. It’s not for aggressive leads or beat but evolving soft pads can be lustrous. The instrument has nothing extra – just play it. No user memory. Wind Instrument Synthesizer, Strings Synthesizer, Organ Synthesizer, Analogue (A), Number of Keys: 49, Size: 4, Production start: 1979, Production end: 1980, Production ended: Yes. Performance Synthesizer, Wind Instrument Synthesizer, Synthesizer Keyboard, Strings Synthesizer, Analogue (A), Size: 4, Number of Keys: 49, Production start: 1978, Production ended: Yes. Strings Synthesizer, Performance Synthesizer, Analogue (A), Size: 4, Number of Keys: 49, Production start: 1979, Production ended: Yes. 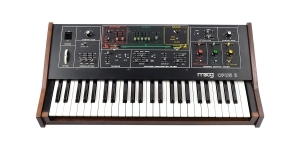 Strings Synthesizer, Synthesizer Keyboard, Synthesizer, Wind Instrument Synthesizer, Performance Synthesizer, Analogue (A), Voices: 8, Oscillators overall: 2, Size: 5, Number of Keys: 61, Production start: 1982.